There is no other church like the Church of Our Lady in Kalundborg – at least in Northern Europe. This five towered structure is not a whim of modern architects – it is one of the first brick buildings in Denmark, constructed some 800 years ago! 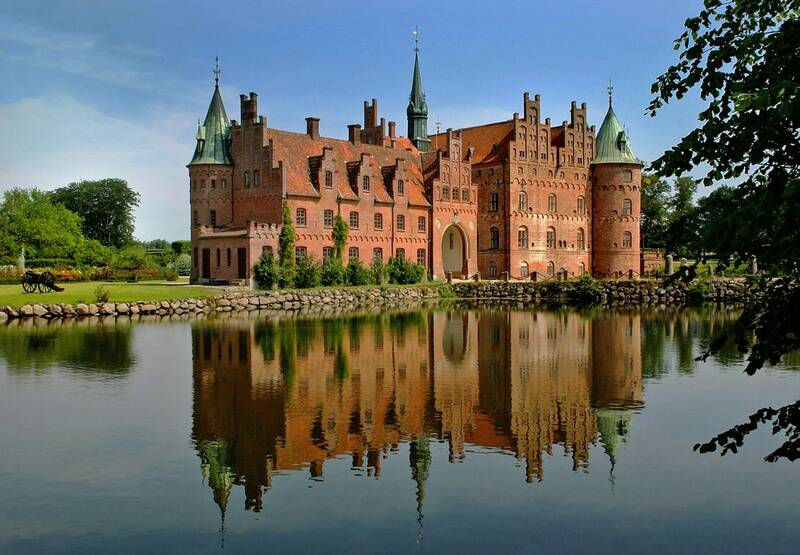 Kalundborg was established by the vigorous nobleman Esbern Snare who built here his castle. Kalundborg evolved into a busy trade center and was one of the first Danish medieval towns to get a fortification wall. Esbern Snare was one of the many European nobleman who were obsessed with the idea of crusades. He called his contemporaries for crusade to Jerusalem already in 1170 but somehow managed to get there only in 1192, at the end of the third crusade. 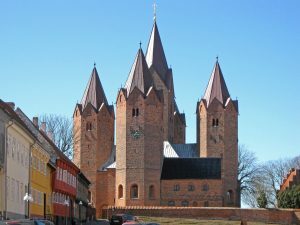 No one can tell it for sure now – but it is very possible that he started to build the church in Kalundborg after the return from the crusade. And it is possible that he was inspired by the sights of the ancient architecture in Jerusalem when deciding about the design of the new church. The church got a planning similar to a Greek cross with five towers – the middle tower was higher and the lateral towers at the each end of the cross – lower. Some art historians see here something common with the design of Church of the Holy Sepulchre in Jerusalem, some consider that this is rather an attempt to imitate the concept of the mythical "heavenly Jerusalem", where God and people will live together by the end of time. 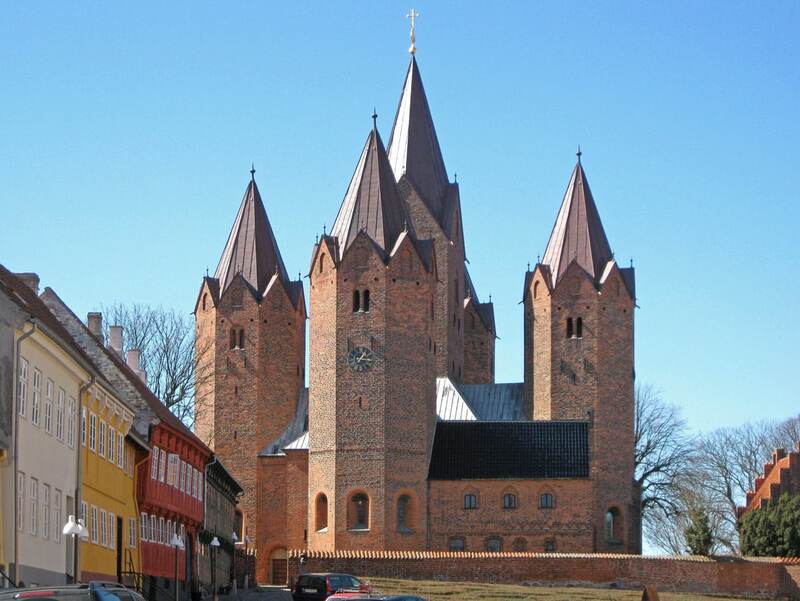 The construction of the church was finished sometimes around 1220 by the daughter of Esbern Snare – Ingeborg and her husband Peder Strangesen. The new church was one of the first brick buildings in Denmark. 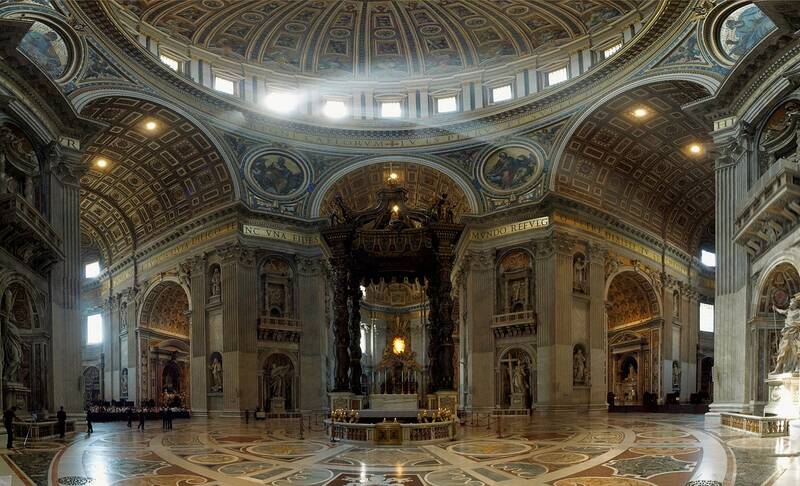 Due to specific structural details it is believed that the church was built by masters from Lombardy, Northern Italy. A mural fragment from sometimes around 1225 shows that the interior of the church originally was decorated with wall paintings. The central tower – Mary’s tower – is 44 m tall. This tower is square-shaped. Other four towers are octagonal, approximately 34 m tall, named St. Anne’s (east), St. Gertrude’s (west), St. Mary Magdalene’s (south) and St. Catherine’s (north). The structural design of the church is… risky. The four lateral towers are held on the vaults of transept – and only from three sides. The central tower basically stands on four granite columns, each 6.2 m high. Incautious excavations inside the church led to a catastroph. On September 7, 1827 the central tower of the church collapsed, destroying much of the medieval furnishings inside. Luckily no one suffered. Tower was rebuilt in 1867 – 1871, basing on the available drawings and measurements. Then much of the furnishings were made anew, in historicism style. Further restorations were made in 1917 – 1921. All towers got new copper coating in 2008 – 2009. Interesting detail in the church is the font – four vessels stacked one on another. The oldest is a massive granite font from the Middle Ages. Stone started to leak – thus a copper vessel was placed inside the font. But… also the copper started to leak. Then an interesting vessel of acrylic glass was placed OVER it. But – it also got worn off. Thus a new, shiny copper vessel stands on top of all these earlier fonts. The interior of the church as a whole is austere. Of huge value are two stained glass windows, which were made by the famous Norwegian artist Emanuel Vigeland in 1926 – 1928. The surroundings of the church fit well to this historical building – next to the church stands the beautiful half-timbered church office and other historical buildings. Vor Frue Sogn, Kalundborg. 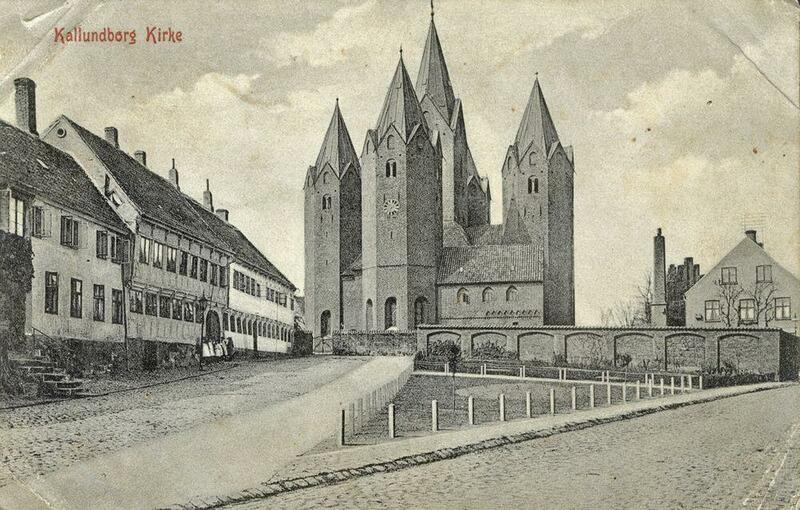 Website of the church in Danish, with rich information about the past and present of this church. Denmark is truly noble European country with rich heritage. While its nature offers few spectacular sights (such as Møns Klint), country has some very interesting archaeological monuments and a huge wealth of exquisite architecture monuments. It seems that with every century Danes got better and better at architectural design. A Companion to Medieval Art brings together cutting-edge scholarship devoted to the Romanesque and Gothic traditions in Northern Europe.